When we are in our cars we can usually see upcoming hazards. If we are paying attention we will steer around an object in the road. The same thing applies to most methods of transportation, from walking to flying an airplane. The surrounding element is air and the bottom is earth, so any object is usually visible to us and can be avoided. The difference in boating is that our vehicle is traveling through two elements at the same time; Air and water. Even though a portion of our vehicle is submerged in water, we can usually only see above the surface. So that seemingly smooth waterway we are traveling can and does have unseen objects that we can collide with. River boating is different than lake boating. Rivers have more floating objects, submerged obstacles and sandbars. An advantage to boating rivers is that moving water provides many more signs of these things than does still water. Piloting a boat safely requires constant awareness of ones surroundings, and particularly of what is ahead. If you wait too long to react to an object, you may have to do some dangerous maneuvers to avoid it, then while your attention is on that you could run aground or hit something else. So the best policy when sighting an object is to make a gradual maneuver well in advance of it. Remember boats don't have brakes. If an object is suddenly spotted the safest procedure is to throttle back and veer off at the same time. Keep in mind that boats do not steer like cars. When you steer a boat it is the stern of boat that actually changes direction and tends to swing out. If a boater gets too close to an object to steer off, the back of the boat and possibly the prop can still collide with it. There are several less obvious signs that can warn a boater of a submerged object. Look for "V"-shaped patterns in the river. This indicates that there may be a hazard ahead. The current is passing by or over a stationary object and creating a wake on the waters surface. This is often a snag extending from a sunken log, but could be any object that is near or at the waterline, yet grounded on the riverbed. One of the worst objects to hit is a vertical steel pipe just below the waterline. Hitting one of those can turn a great day of boating into a disaster (the author knows this one from experience). Many times a "V" pattern will be caused by a small swimming animal, which we also want to avoid for their sake. It is not important to analyze what might be creating the wake. It is important to begin maneuvers away from them as soon as they are spotted. Don't wait until its too late to make a decision about it! All stationary objects in moving water create turbulence, some less noticeable than others. Large rocks, discarded appliances (sad but true), and other large objects do not slice the water as do small objects and so do not always have the defined "V" pattern at the surface. The current passes over them in the form of a swell. A swell can be created by an object several feet below the surface, depending on its size and the currents speed. A boat hull may pass easily over the object, but the prop may not. Many props and lower units have been ruined this way. Don't take the risk! Avoid any disturbance to the natural flow of the river. In some rivers there are sections that are shallow and rocky with swells and boils from bank to bank. In this case a wise boater will slow down, steer toward the least active swells, and if possible, elevate the prop. It is best to keep the boat under power for steering. Drifting into a section like this can allow the boat to become stuck broadside against a rock, which in faster waters could lift one side of the boat high enough to swamp it. Swells in the river are more difficult to spot when traveling downstream. This is because the slight rise of water will hide its trailing wake from a distance. The combination of this and the boat being pushed by the current dictates that we should take extra care in watching for the warning signs and take evasive action sooner. Steering is not as responsive downstream as it is upstream. Sand and gravel bars are the most deceptive of submerged objects. The huge amounts of agricultural runoff and bank erosion create an on-going challenge to river boaters in the form of sandbars, which can form and change very quickly during periods of high water. Running into a sandbar can result in a minor inconvenience or become a life-threatening situation. A few years ago, a family was enjoying a cruise down the Wabash River in Indiana in an old pontoon boat. The current was very fast and they were heading downriver at full throttle. Not noticing a submerged sandbar that could have been avoided, the port side pontoon ran aground with such force that it spun the boat sideways and ripped loose from the deck. Two people fell overboard and were able to get to the sandbar. The rest of the boat with only one pontoon when down the river until the deck grounded in shallow water with three other people hanging onto it. A passing fisherman came to their rescue, and then picked the two people up that were still standing in knee-deep water on the sandbar. This story is an extreme example of what can happen when we are not reading the river. The best known and usually accurate rule for staying in the deepest part of the river or channel is to steer to the outside of bends and in the middle of the river in straight sections. As we are cruising on a river we can actually look well ahead of our position and visualize the course of least resistance as the water is flowing downriver. That path of least resistance is where the channel will generally flow. As water rounds a bend it tends to flow faster, scouring out a channel. Where the flow comes out of a bend and into a straight section or an opposite bend, it will make a cross-over to the middle or opposite side. There are exceptions to this and the river can surprise us when we least expect it. Whether traveling on straight or winding rivers, caution should be taken when approaching tributaries. Streams carry silt, gravel and rocks that will often build up just below the mouth of the tributary. It is wise to steer away from these outlets. Bridges and other man-made obstacles can create a dam effect as the collection point for sand, silt, and gravel. Caution is advised even when approaching areas that show signs of a bridge that has been removed. Care is not always taken when bridges are demolished, and there is often material dropped in the riverbed that can not only create a sandbar but can damage a boat in low water. In addition to these obvious signs of possible shallow water, there are also surface water reactions that can act as a warning. Always look for a break in the continuity of the water. If the water is choppy, take notice of a smoother spot. If the water is smooth, beware of choppy spots. These conditions can be the result of wind or shifting channels, but can also be the effect of shallow water passing over a sandbar. Shallow waters also have an affect on the prop wash of powerboats. If you notice any difference in the feel of the boat or the prop wash changing, you should be aware of possible water-depth change. Another indication of a sandbar is the movement of floating objects. Eddies are often formed just downriver from a sandbar that floating objects can get caught in. If an object is not moving with the current it may be in an eddy near a sandbar, or may be in shallow water and not floating at all. Either case is a good reason to avoid the area. Depth finders are also very helpful when running at slower speeds. You can usually see a gradual decrease in the depth reading and become aware of approaching shallows. If you are running fast, it is best to rely on reading the river, as you will already be grounded by the time the depth finder sends its signal and you can react to it. While boating on navigable rivers and following the sail lines and buoys, sandbars are not of great concern. But when diverting from the buoy markers and on other waterways, sandbars are something that a boater should be on constant alert for. Getting a small craft free from being grounded is usually fairly easy, but in some cases can be quite difficult, dangerous, and damaging to the boat. Piloting a boat at night makes spotting signs of submerged sandbars and other objects more difficult and requires slow speed and vigilant watch. It also requires listening for turbulent water. Some friends of mine were cruising the White River in Indiana at night. They were traveling upriver when they ran aground hard with their 21-foot cabin cruiser. It was late so they decided to secure the boat where they were stuck, get some sleep, and take care of it in the morning. What they didn't anticipate was the river falling rapidly overnight. The next morning they discovered that the boat was no longer in the water, and it took an entire day of digging a canal under the hull to finally float the boat off. The lesson learned here may be to address the problem when it occurs and sleep later. Many rivers have an unpredictable rise and fall rate which should always be kept in mind when a situation like this arises. This factor should also be considered when beaching a boat for the night. Color can also be a factor while reading the river. The sky color usually determines the reflected color of the water; however, the actual color that you see at close range can tell you something about what may be below the surface. First, any sudden change in water color could be a sign of depth change. Even murky waters will have a lighter appearance in shallow areas because more light is reflected off the riverbed. Shallow water also tends to have submerged vegetation that will affect the color. Judging water color for navigation is more difficult on sunny days, due to the intensity of reflections. A common reason for a sudden change in water color can also be the confluence of a tributary, where the water pouring in is clearer or murkier than the river, which is also a sign to be careful of a sandbar. Reading the river can also include the riverbank. As a rule the slope of the bank will continue into the water at about the same angle as you see it, so a high steep bank is more likely to have deeper water along it than a gradual sloping bank. Riverbanks with large amounts of erosion are more likely to have sandbars just downriver, usually on inside bends. The shape of the shoreline can also be a factor in water depth. Whether the river is wide or narrow, it is still carrying about the same volume of water, so as a river narrows the current runs faster and scours a deeper channel. The shoreline can also provide warning signs of possible hazards in the river. Any shoreline that has a road leading to it has a greater possibility of having dumped material in the river. 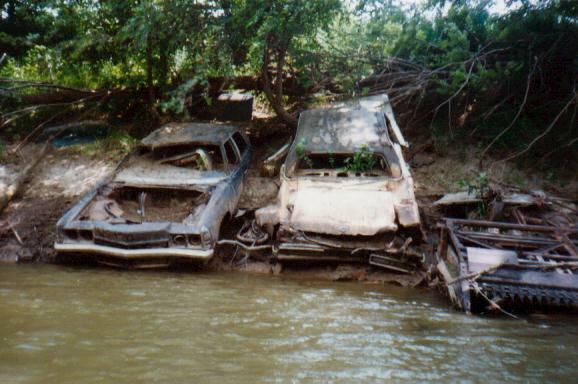 I have seen cars, appliances, bathtubs, and many other discarded objects that can damage a boat. One might think that urban areas would have more of this than rural areas, but people will usually go to a remote place to do their dirty work, with less chance of getting caught. Areas with riverside factories, utilities, and other development should alert a boater to the possibility of submerged pipes, concrete, and other materials to watch for and avoid. Another valuable sense we can use in reading the river is sound. Upcoming hazards can often be detected by sound, before they are sighted, especially on smaller winding rivers. The sound of rushing water should not be ignored. Those sounds could be a harmless brook flowing into the river, a drain pipe, or low hanging tree limbs. It could also be upcoming rapids or dangerous obstacles in the water. During the night an increase in the sound of water can be a signal that it is rising. The sound of an approaching boat and even car or train sounds alert a boater to upcoming conditions. Sounds are especially important when boating after sunset. A spotlight beam has limited range and coverage, so the sound of water passing over a submerged object may be the first alert to it. Depth finders rely on bouncing a sound wave off the riverbed and back to the sending unit. It is also wise to pay attention to sounds above the water for safe navigation. It is important to determine whether the river is rising, stationary, or falling. There are signs to look for that will help determine which condition is present. Larger than normal amounts of floating debris is the most obvious indicator of a rising river. Debris collects along the bank and is washed away as the water rises. Some debris will also be present after heavy rains with no significant rise. As a general rule debris will tend to float near the center of the river when it is rising and move closer to the shore as it becomes stationary and falls. Observing an eroded mud bank will give clues that the water level is dropping rapidly. The mud will stay wet and appear darker well above the normal splash line. Some debris will also cling to tree trunks and shoreline for a time, further indicating a falling river. A stationary river stage is the most difficult to determine and can usually be noticed by the absence of conditions present during rise and fall. Navigable rivers with dams are usually kept at a determined pool stage with little fluctuation. Free-flowing rivers can change suddenly by upriver weather conditions, thawing, or dam release on tributaries. The most surprising sign that the river stage has changed is to discover water flowing into a tent during the night, or wake up to find ones boat sitting high and dry in the same spot it was floating the night before. These are good reasons to be aware of changing river levels. While landed on a beach or camping it is always a good idea to poke a stick at the waters edge and check it now and then, to see if there are any changes. While reading this information, it may be observed that references made to reading the river includes words like could, may, usually, and possibly. The reason is that this is not an exact science. All of the things discussed provide a guide to go by and in most cases will be accurate, but rivers are unpredictable and when we let our guard down or least expect it, the river will surprise us. We should take nothing for granted. Reading the river is a skill that will develop over time and become second nature. A slight deviation in the flow or an object unnoticed by many people will be detected by an observant boater. Boating, canoeing and kayaking are encouraged on our rivers and most people have a safe and pleasant experience. This writing is to be informative and in no way is an attempt to discourage anyone from enjoying our rivers.